Banger Films, in association with Eagle Rock Entertainment, is set to produce the first-ever feature length documentary exploring the fascinating, mysterious tale of Texas band ZZ TOP. The filmmakers, Scot McFadyen and Sam Dunn, are calling out to fans for help finding rare photos, videos, and audio to tell the story. 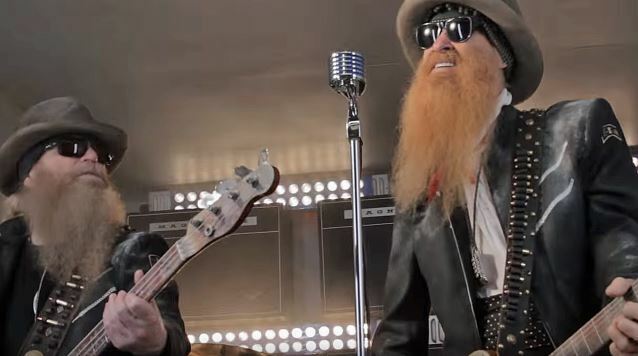 “We’re big admirers of ZZ TOP, so we’re thrilled to be working on this film. ZZ TOP is rock’s longest-standing power trio and have influenced legions of rock, pop and country artists, but there’s very little archival material documenting this band’s past. So we need their fans to help us out!” says Dunn. ZZ TOP — guitarist Gibbons, Dusty Hill on bass and drummer Frank Beard — ascended the rock ladder through a combination of infectious boogie-blues riffs, restless experimentation, and blistering live shows to become one of the most celebrated and successful bands of all time. And yet for many music fans they remain a mystery. In the 1980s, when the group was at the top of the MTV heap, with fur-lined guitars, foot-long beards, a bevy of babes, and selling upwards of twenty million records, they remained shrouded in a gumbo of conjecture, folklore, and downright leg pulling. As 2016 dawns, with the band still beloved by fans and musicians alike, ZZ TOP‘s story remains untold — until now. Leveraging on Banger Films‘ own trailblazing documentaries, “Rush: Beyond The Lighted Stage” and “Super Duper Alice Cooper”, the yet-to-be-titled ZZ TOP documentary will be an unblinkered, uninhibited film featuring the band, their friends and intimates — stuffed with unseen footage and photos and never-before-heard audio tracks, detailing the band’s history. Viewers will witness the extraordinary story of three friends, each musical purists and master bluesmen on a lifelong mission to show music lovers a Texas-style good time. According to The Pulse Of Radio, Ace Frehley has set a string of mainly Southern dates over the next few months. 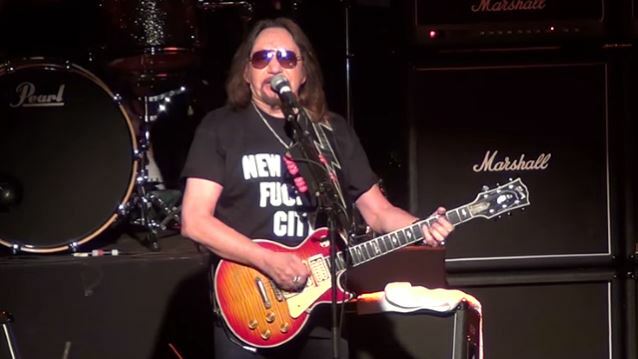 Frehley kicks off his 2016 shows on February 26 in Houston, Texas at Scout Bar, and as of now, wraps the run up over two nights on April 11 and April 12 at New York City’s B.B. King Blues Club. In August 2014, the KISS co-founder released his sixth solo album, the critically acclaimed “Space Invader”, which included a surprise cover of the STEVE MILLER BAND‘s “The Joker”. “Space Invader”, the first new solo album from Frehley in five years, sold around 19,000 copies in the United States in its first week of release to land at position No. 9 on The Billboard 200 chart. Ace‘s previous CD, “Anomaly”, opened with around 17,000 units back in September 2009 to debut at No. 27. ’80s hard rock queen Lita Ford will release a new album, “Time Capsule”, on April 15 via SPV/Steamhammer. The very special and unusual recording turns back the clock to a time when honest, down-to-earth rock music was still handmade and recorded without digital tricks and contraptions. “Time Capsule” is a “throwback” record that boasts identifiable voices and brilliant players jamming without any planning or pressure. Some of the album’s highlights: Billy Sheehan (bass), Rodger Carter (drums), Dave Navarro (mandolin), Jeff Scott Soto (vocals), Rick Nielsen and Robin Zander (backing vocals) and Gene Simmons (bass). “Time Capsule” contains ten songs plus an intro and will be available as a digipak as well as an LP version and download. It’s Ford‘s gift to fans who love the ’80s, when thrilling vocal performances, raunchy riffs, and loud, growling guitars were as essential as oxygen. Dey Street Books (formerly It Books), an imprint of HarperCollins Publishers, has set a February 23 release date for “Lita Ford – Living Like A Runaway: A Memoir”. In this 272-page hardcover book, which was originally expected in 2014, the former lead guitarist of THE RUNAWAYS opens up about the ’70s and ’80s music scene, and her extraordinary life and career. 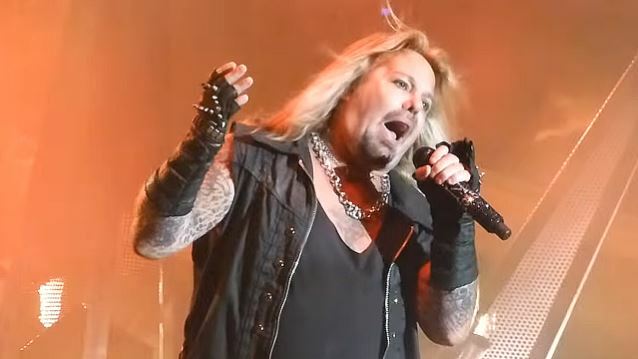 MÖTLEY CRÜE singer Vince Neil has hinted in a new interview that his solo band is working on new material, with the possibility of road testing some of those songs on his current tour. Neil‘s first solo album, “Exposed”, came out in 1993, reaching No. 13 on The Billboard 200 chart. His follow-up effort, “Carved In Stone”, arrived two years later. Neil‘s third and latest solo album, “Tattoos & Tequila”, was released in 2010 and included two originals along with covers of classics songs from AEROSMITH, SCORPIONS and SWEET. “Tattoos & Tequila” sold 7,500 copies in the United States in its first week of release to land at position No. 57 on The Billboard 200 chart. Neil recorded “Tattoos & Tequila” in the winter of 2009 with his solo live backing band, which continues to consist of bassist Dana Strum and Jeff Blando (both of SLAUGHTER) and drummer Zoltan Chaney. According to Billboard.com, MÖTLEY CRÜE‘s three final shows at the Staples Center (on December 28, December 30 and December 31) were seen by 37,000 fans, generating $2.7 million in box office revenue. MÖTLEY CRÜE‘s “The Final Tour” saw the band perform across five continents (North America, South America, Europe, Australia and Asia) for a total of more than 164 shows in 72 markets, grossing $100 million. MÖTLEY CRÜE announced that a full-length concert film will be released this year. The movie will include exclusive interviews and behind-the-scenes footage of the last week of the band’s five-continent tour, which began in July 2014. The Smithsonian Institution’s National Museum of American History has just posted a video profile of ANTHRAX, “How New York of the ’80s Helped Influence Anthrax to Create East Coast Thrash,” as part of its Places of Invention exhibit’s interactive online map. In 2016, ANTHRAX will celebrate its 35th anniversary as a band with the release of one of the year’s most-anticipated metal/thrash albums, “For All Kings”, due out February 26 (Megaforce in North America and Nuclear Blast internationally). The eleven-song crusher that the band’s drummer Charlie Benante promises will be “aggressive and super-thrashy,” was written by Benante, bassist Frank Bello and rhythm guitarist Scott Ian, the dynamic triumvirate whose unique composition chemistry is, in part, what sets ANTHRAX‘s music apart from other bands in the same genre. Add to that Joey Belladonna‘s breathtaking vocals and the searing guitar leads by newest member Jonathan Donais, and it’s no wonder the band is so excited for fans to hear what will be their eleventh studio album. 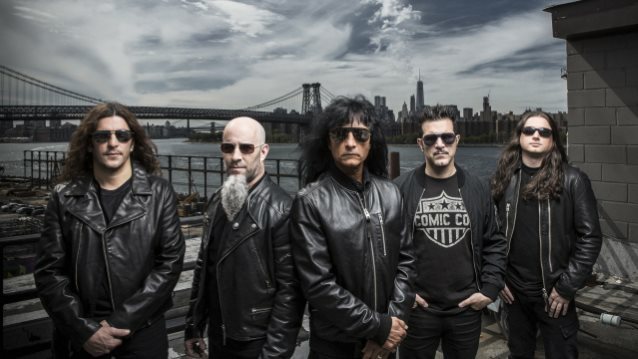 Over its 35-year career, ANTHRAX has been a pioneering band with its unique style, sound and heavy brand of thrash metal, and, as METALLICA‘s Kirk Hammett put it, “one can hear their influence on any number of up and coming bands.” ANTHRAX has sold in excess of 10-million units, received multiple gold and platinum certifications, six Grammy nominations and a host of other accolades from the media, industry and fans. From the race and genre barriers ANTHRAX helped break down in 1988 when they collaborated with PUBLIC ENEMY on “Bring The Noise”, to becoming a card-carrying member of the “Big Four” — with METALLICA, SLAYER and MEGADETH — as one of the four bands that defined the speed/thrash metal genre, to being the first metal band to have its music heard on Mars when NASA played “Got The Time” to wake up the Mars Rover, ANTHRAX has never been afraid to take chances. Guitarist Richard Fortus and keyboardist Dizzy Reed have left THE DEAD DAISIES, leading to speculation that they will be part of the reunited GUNS N’ ROSES lineup. Fortus and Reed exited THE DEAD DAISIES in order to take part in “a momentous project in 2016,” THE DEAD DAISIES said in a statement. THE DEAD DAISIES have commenced work on a new album with producer Marti Frederiksen in Nashville for a late 2016 release. Joining bassist Marco Mendoza, guitarist David Lowy, singer John Corabi and drummer Brian Tichy in the studio is former WHITESNAKE and DIO guitarist Doug Aldrich. Lowy says: “It’s been a privilege and a pleasure to write, record and perform with such talented world-class musicians and all-around great guys. I’ve personally learned so much from both of them. Aldrich says: “I’m very, very happy to join my friends Marco, Brian, John and David in the next chapter of THE DEAD DAISIES. I love the band and I’m looking forward to getting busy on the new record. Fortus adds: “When we started speaking about finding someone to replace me, the first suggestion I had was Doug Aldrich. It doesn’t get any better than Doug in my book. I am so happy that he is able and willing to step in and take over. I think that it will elevate the band to the next level. GUNS N’ ROSES has announced four headlining performances in April, with original members Axl Rose, Slash and Duff McKagan the only members confirmed so far. The rest of the lineup for the shows — and a potential tour later in the year — remains unclear, although keyboardist Chris Pitman, Reed, drummer Frank Ferrer and Fortus are all believed to be involved. The status of original members Izzy Stradlin and Steven Adler remains unknown, along with that of “Use Your Illusion”-era drummer Matt Sorum. TWISTED SISTER will perform at the first annual Vegas Rocks! Hair Metal Awards, set to take place Sunday, May 15 at the Casablanca Event Center At Eastside Cannery Casino in Las Vegas, Nevada. There will be historic performances with honorees and participants, including a special all-star celebrity jam for the finale of the show. The event will be co-hosted by the “publishing queen of rock n’ roll” Sally Steele, Vegas Rocks! Magazine publisher/ founder/ CEO. Sally‘s co-host this year will be Nick Hawk from Showtime‘s hit television series “Gigolos”. The event will be preceded by a Grand Rock ‘N’ Roll Royal Red Carpet media event at 6 p.m., with appearances with major celebrities and some of the most famous rock artists in the music industry. The ticket prices for this event are from $19 to $35 for floor seats.